Throughout her four years as a pharmacy technician, Ruth Del Rio learned why she and her fellow techs are the “unsung heroes” of a retail pharmacy. Though she is relatively new to the world of retail pharmacy, Ms. Del Rio thrived in the high-pressure environment. Del Rio developed essential skills that she claims separate strong technicians from weak ones. “I’ve worked at multiple stores, and I’ve seen how an unskilled technician can hurt the pharmacy, and worse, the customer,” said Ms. Del Rio. In Ms. Del Rio’s experience, many technicians breeze through customer interactions, hoping to fill as many prescriptions as possible. She says an abrupt approach to customer service is never productive. Ms. Del Rio advises new technicians to take a genuine interest in each customer’s life and well being. Expressing concern about the patient’s life and well-being demonstrates they mean more to the pharmacy than the value of their prescription. “That’s how you make the connection which leads to long-term patient relationships,” said Ms. Del Rio. Effective communication built on trust is needed when handling a person’s medication. “You have to be very open with your customers to be a successful tech,” said Ms. Del Rio. “It’s your job [as a technician] to make the customer feel at ease because they are putting their health in your hands." Technicians are privy to the most sensitive details of their patients’ health, which is another reason why earning a customer’s trust is essential. One way to lose a customer’s trust and business is to treat them without dignity. Ms. Del Rio has seen that scenario play out countless times, and often receives new customers who had a bad experience at other pharmacies. “On one occasion I worked with a gentleman who told me that a particular pharmacy didn’t treat him like a human being because of the medication he was attempting to fill,” said Ms. Del Rio. “He told me: You treated me with respect and as a human being. You didn’t treat me like a criminal or like I was doing something wrong. You told me upfront what to expect, and it made me feel seen." Ms. Del Rio earned a customer for life just by being gracious. Patients often deal with health problems that can be embarrassing or scary. The last thing a customer wants is to feel less than human. Capable technicians are the backbone of a successful pharmacy, yet some may overlook their importance. When it comes to medications, pharmacy technicians must maintain the same working knowledge as the pharmacists, while also mastering the pharmacy's day-to-day processes, all while delivering excellent customer service" As if that responsibility wasn’t enough, Ms. Del Rio says technicians must continue expanding their knowledge to be effective. “Technicians need to answer a customer’s questions without waiting for the pharmacist,” said Ms. Del Rio. Ms. Del Rio believes the ability to multitask and remain calm under pressure is an essential skill. “Technicians have customers coming in from the left and right, and each [customer] deserves your full attention,” said Ms. Del Rio. Unfortunately, some people violate the privacy of their fellow customers. For other patients, filling a prescription can be a stressful experience. Ms. Del Rio said there are a variety of reasons customers can become disgruntled and lose their cool - but that’s not an excuse for techs to lose theirs. The satisfaction of Ms. Del Rio’s job comes from her patients' appreciation and the long-term relationships she has built with them. Ms. Del Rio suggests technicians do whatever it takes to deliver memorable customer experiences. 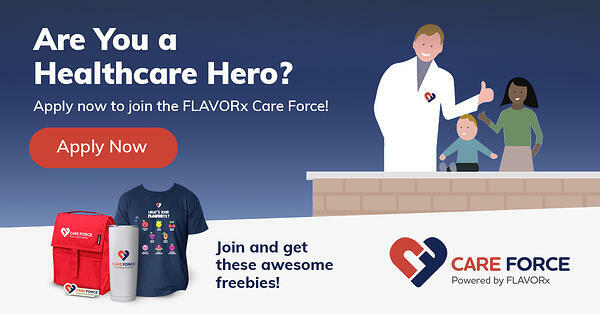 See how you can offer memorable experience to your customers through our new program for Pharmacy professionals, The FLAVORx Care Force! Copyright © 2015 FLAVORx Inc. All Rights Reserved.